Profile rail is commonly supplied as four track recirculating balls or rollers running on appropriate linear track. This is referred to as “Profile Rail” or “Linear Rail”. The range of bearing rail allows customised selection to suit your application relating to loads, installation dimensions, environment conditions, linear speed and duty cycles. This versatile range is non-interchangeable between brands, however there is some commonality on crucial mounting dimensions, therefore you cannot put X brand bearing on Y brand rail. Profile rail offers higher performance characteristics and lower overall height installation dimensions than that of traditional round bar and linear sets. 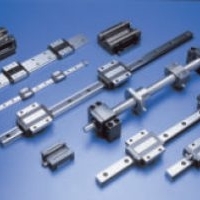 Manufacturer’s that we represent include, THK / NSK / TBI / REXROTH / STAR / NB / and economy series. For further information on our range of linear motion rail guides (other brands available on request), please contact our sales team.